A lucky break: Harris-Teeter advertised leg quarters for 29 cents a pound. Though I prefer bone-in breasts, the thigh and legs make for flavorful pot pies and taco fillings. This $1.92 package includes eight large quarters. I will use four for Hillbilly Housewife chicken and dumplings, saving the rest for Wednesday. This not-so-healthy entree is one my husband loves--fitting for a birthday indulgence. Maggie's recipe calls for stewing the chicken one day in advance. It makes a bit too much for my largest pot, so I reserve two cups of broth before adding the dough. That broth can be used to steam vegetables for another meal. Check back tonight for a full cost breakdown of the whole meal, and don't forget to see what The Aldi Queen's got cookin' later. Meredith- First time comment but I read you almost daily and I love your blog. I can honestly say you inspire me to be a better steward. Anyway, I'm curious how much time you spend menu planning by using sales circulars vs. pantry/ stockpile. I use the sales circulars usually but find it more time consuming and thus tiresome. Thanks for the link to the chicken and dumplings. It's one of my hubby's faves and I'm always looking for a new recipe to try- haven't found a winner yet but this may be it. Since I have 10 lbs. 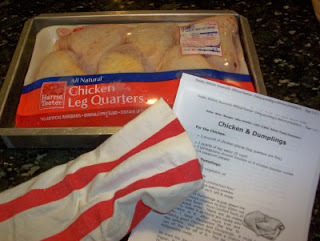 of chicken leg quarters defrosted in my sick right now, I think we'll be trying this either tonight or tomorrow! Thanks for recipe that sounds easy and good. You can never have too many of those. Sounds like a great recipe. I'll be trying it soon! And what a GREAT buy!!! This is so fun to read, both yours & The Aldi Queen's! It's great to have tested recipes with cost estimates to use. Thank you! Good chicken to food, heart and dumpling. Make for night and happy family. I'm very excited about this contest! Aldi's has good prices, but I *think* I do better (or at least just as well) by shopping sales w/ coupons. I still drop by there to get some things, but it's not a regular stop for me. I'll be watching this with interest!